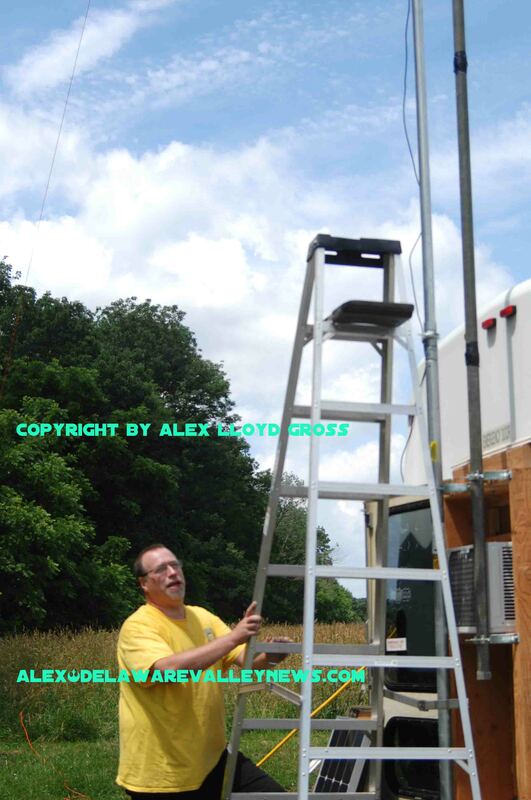 Alex Lloyd Gross- Photo- Delaware Valley News.com Steve Wilans checks an antenna on his communications vehicle. Members of the Penn Wireless Association set up shop at the upper Plantation Field at Tyler State Park in Newtown Pa. They had cut circles into high grass and set up antennas. Some members brought tents or specially outfitted communications vehicles . They were there to try to contact people with Ham Radios across North America. This past weekend, there were thousands of people doing the same thing across the country. It was called Field Day. Only those other people were hoping that Penn Wireless would be one of the stations they could contact. Alex Lloyd Gross Photo- Delaware Valley News.com A look at some portable communications equipment. The purpose was to use radios on emergency power and see what worked and what did not. Antennas were strung through trees. Some were simply vertical aerials that were erected via push up poles. Some worked better than others. This weekend, radio enthusiasts were at the mercy of the weather. While thunderstorms were a threat to Penn Wireless, other stations saw them as a reality and had to shut down operations. One lightning strike could ruin thousands of dollars in equipment. The other thing that was uncontrollable was the atmosphere,. Radio signals bounce down and if the atmosphere is bad, those signals don’t travel far, or do not travel enough to give a clear signal. Sunday, was the better day for Penn Wireless, who had the capacity to operate up to seven radios at a time. 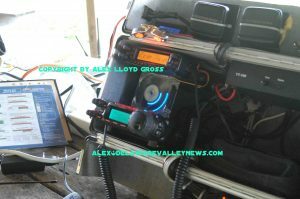 This Field Day event was held for two days , but the bulk of the stations that were contacted was on Sunday due to the weather. “This is about find out what works and what does not.” said club member Steven Wilans. This was done in a public area and the circles in the grass and antennas attracted many curious park goers. Those that wanted to, were offered an opportunity to get on the air and transmit with a club member. Field Day will take place again next year, it’s the last full weekend in June and Hams across the globe participate in it. Ham radio requires a license to operate . Penn Wireless meets the fourth Monday of the month at the Falls Township Municipal Building. Tests for licenses are given there. They cost $15.00.